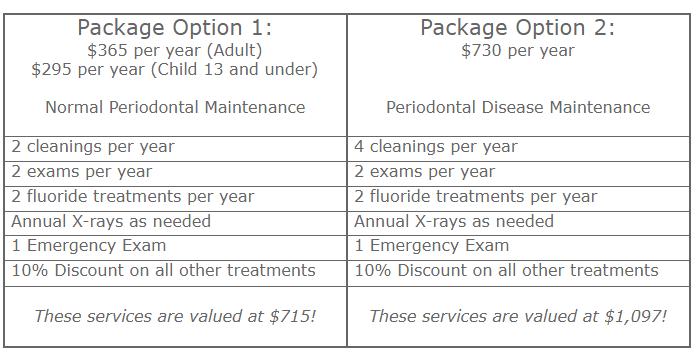 Drower Dentistry now offers a Preventative Care Package exclusively for established patients without dental insurance. This is not an insurance plan, but rather a prepayment program to help our patients who do not have dental insurance ease the financial burden of their personal dental care needs. “Preventative Care Package” payment must be paid upfront for a 12 month period, and may not be combined with any other offers or discounts. After enrolling in a pre-paid package services and discounts will last for 12 consecutive months. It is the patient’s responsibility to schedule and maintain their appointments. No refunds or exchanges between patients. Not a current patient? No problem!